I always have coconut oil around since it’s been claimed to increase your metabolism and keep your energy up while burning fat and building muscle. I use it instead of olive oil to saute veggies and I also sometimes mix it with baking cocoa for a dark chocolate snack. That stuff is pretty tasty and for those who don’t like coconut, it isn’t as coconutty as you might think. My skin has been so dry and itchy since we’re now in the first part of winter. I spend a lot of time outside, bundled up either walking Thing Two, running sprints, or doing some other activity. A friend who knows that I use coconut oil in cooking let me in on something. You can use coconut oil for a bazillion things other than eating it! I’ve been using it lately for just about everything under the sun. 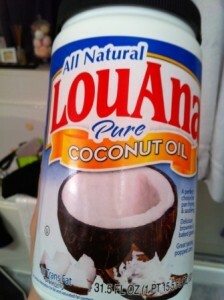 I got a huge container of the LouAna brand for about $3 at Walmart. Huh-yoooooo-guh container! Can’t beat that price for the multitude of uses for it. It’s apparently nature’s little known bargain. Body Lotion – Smear some on, particularly after a hot shower or bath to ease dry skin. It melts on you like buttah. You can also massage sore muscles while doing this. Lip Balm – Helps heal and prevent chapped lips. Just don’t lick the stuff off continuously or it will defeat the purpose. Moisturizer – Use a little bit instead of your regular moisturizer during the winter. Guys, you can use it and still feel and smell manly while preventing lines and wrinkles. Eye Cream – Dab some under your eyes while you’re moisturizing the rest of your face. Again giving up your Man Card is not required for this. Shaving Cream – Helps lubricate the skin for a close shave and moisturizes at the same time. It does make the tub or shower slippery, so be careful in there! Hair De-frizzer – Rub a tiny bit between your palms to melt and run your hands over your hair to calm flyaways and de-frizz. Don’t use too much or you’ll look like a flashback to the ‘50s. Make-Up Remover – Take your contacts out first, but coconut oil will dissolve even the toughest waterproof mascara and not make you look like a backup singer for Kiss. Massage Oil – See number 1 but this use is even better if you can convince someone else to do the massaging. Maybe I should pay The Kid to massage my shoulders and feet. Nose Moisturizer – When your poor nose is all red and sore from blowing, rub some on and leave overnight to return your nose back to normal and prevent nose bleeds. Diaper Balm – For the babies, it is gentle on skin and can be applied instead of diaper cream to prevent or heal diaper rash. Homemade Body Scrub – Mix with kosher salt or sugar into a paste and rub all over to smooth and soften skin. Rinse off in the shower and pat dry. Don’t forget to be careful after greasing the shower floor! Cuts and Scrapes – Rub on cuts and scrapes instead of vitamin E or Neosporin. Coconut oil has anti-bacterial properties and helps speed healing. It may also lessen the chance of scarring too. Bug Bites and Itching – Rub on bug bites or healing cuts/incisions to stop itching and burning. Skin Problems – I read that rubbing coconut oil on also helps heal psoriasis, dermatitis, eczema, canker sores, cold sores, acne, and athlete’s foot. I haven’t personally used it for this, but it may be worth a try and is sure cheaper than other over the counter remedies. Check with your doctor first please. Deodorant – Try this one at your own stinky risk but I read that you can mix coconut oil with baking soda and use it as a natural deodorant. I’m not sure I’ll use it for this because most days I’m in the gym and sweating heavily. On a day with normal sweat levels it may be worth a try. So there are quite a few uses for coconut oil besides the obvious. Go forth and be nutty! Hopefully this doesn’t cause a worldwide shortage of coconuts. Did you know that there were so many uses for it? What are some other ways to try it?